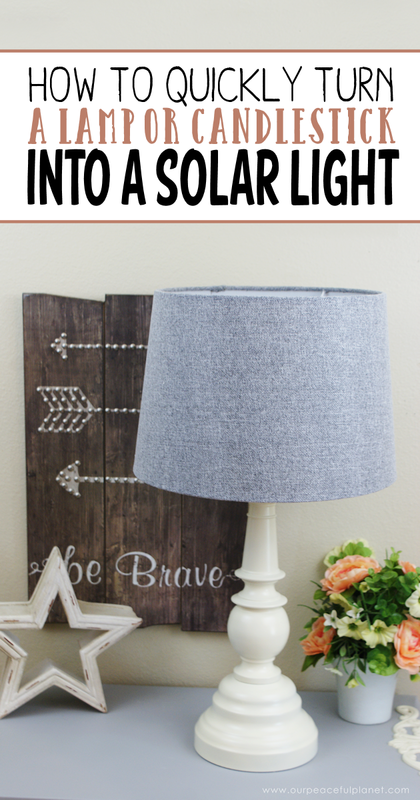 If you’re wanting to be a bit more energy conscious, making a solar lamp is a great start and it’s so easy using the outdoor solar path lights you can get from the dollar store! 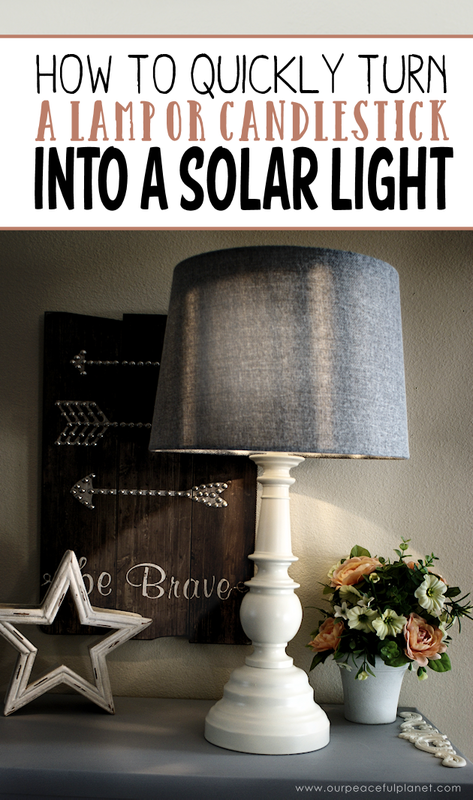 We made two of them, one using an old electrical lamp we had and another using a wood candlestick that we bought a small lampshade for. They both turned out beautiful and work great as the photos show. 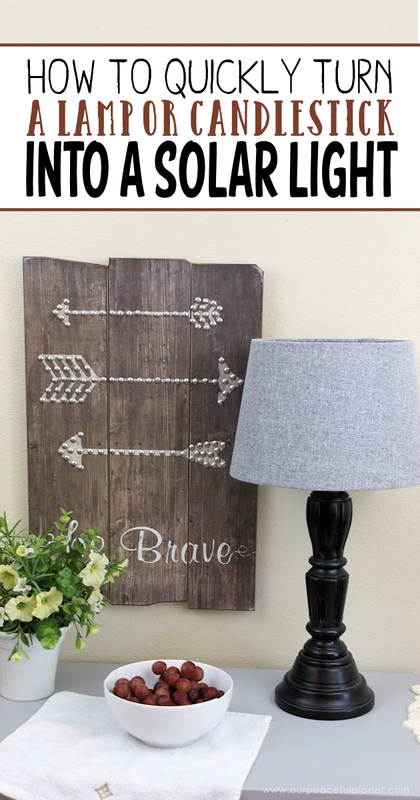 We’re all about saving money so make sure to check out some of our other fun ideas for low cost decor such as Frugal DIY Bedroom Decorating Ideas and Classy Living Room Ideas on a Budget. You’re bound to find something to spur your imagination! 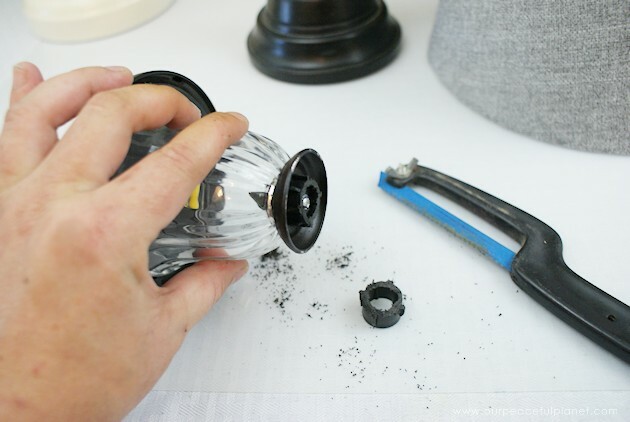 DIY ON PATH LIGHTS: You can buy these at the Dollar Store. 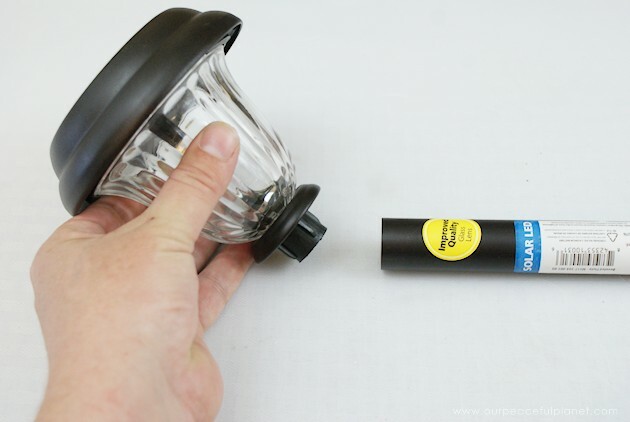 Walmart, Lowes and other hardware stores also carry them. You want the cheap plastic ones. 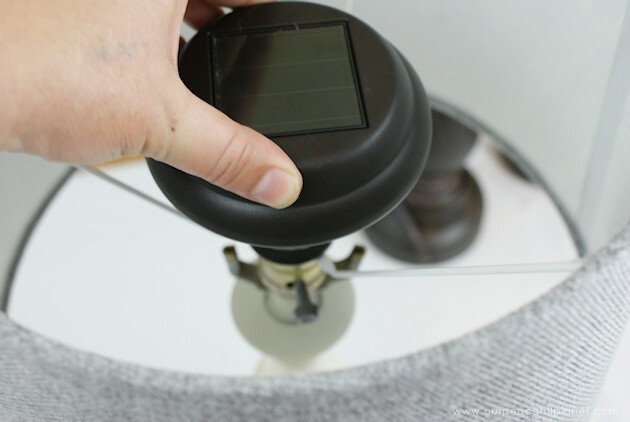 Begin by opening the solar lights. 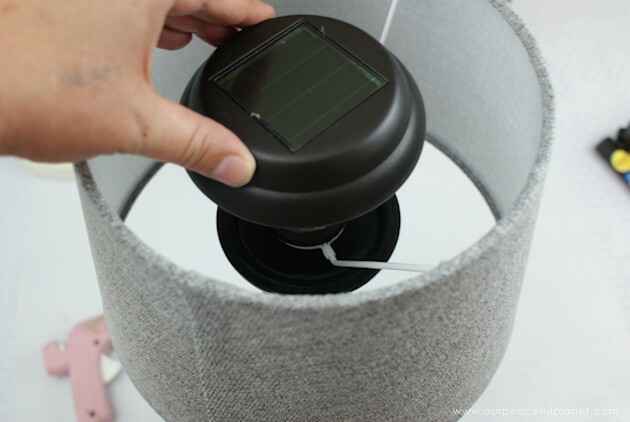 Remove the pull tab so that the solar light is active. 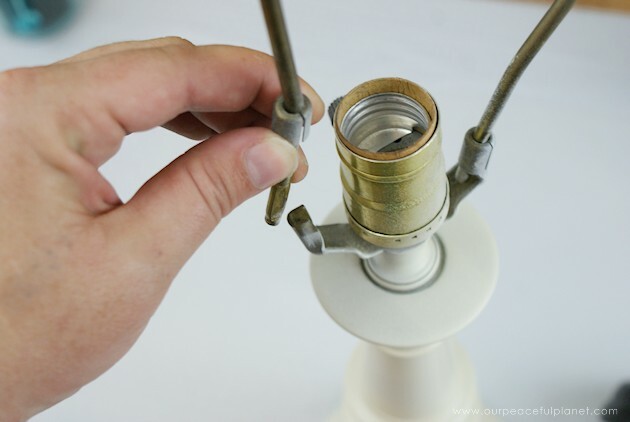 Remove the light portion of the solar light from the ground stake. 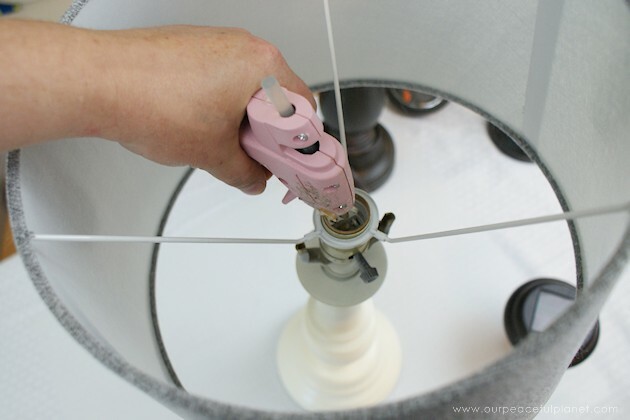 Remove the bottom of the lamp. 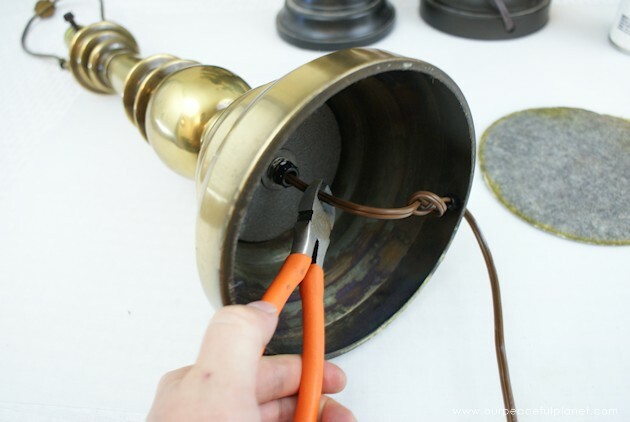 Cut the power cord and remove it from the lamp. 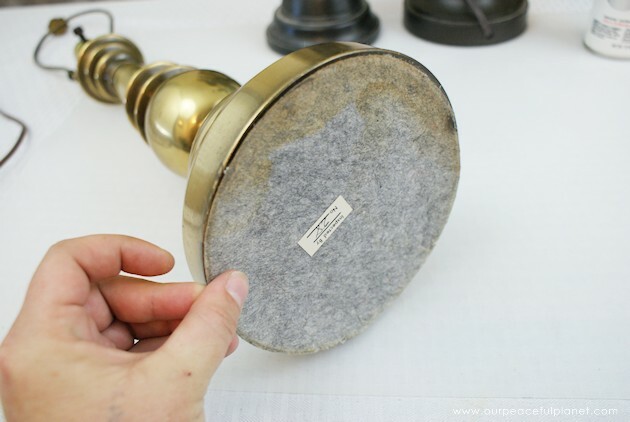 Replace the bottom of the lamp. 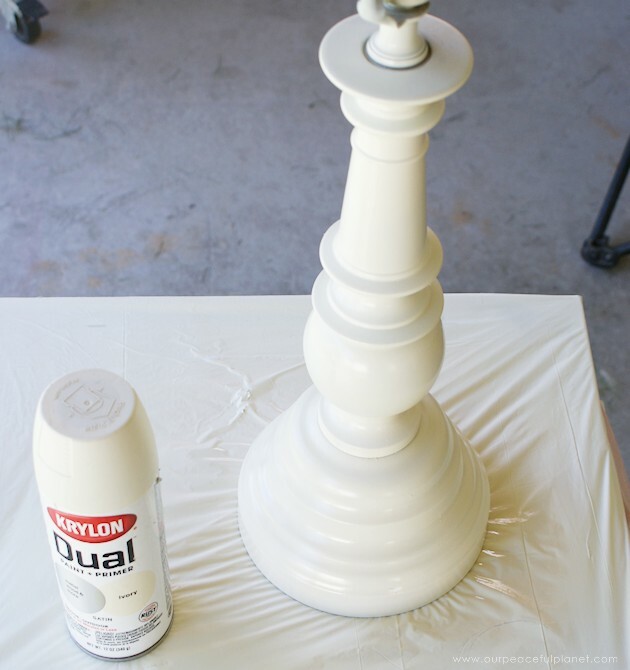 Spray paint the lamp in the color of your choice. 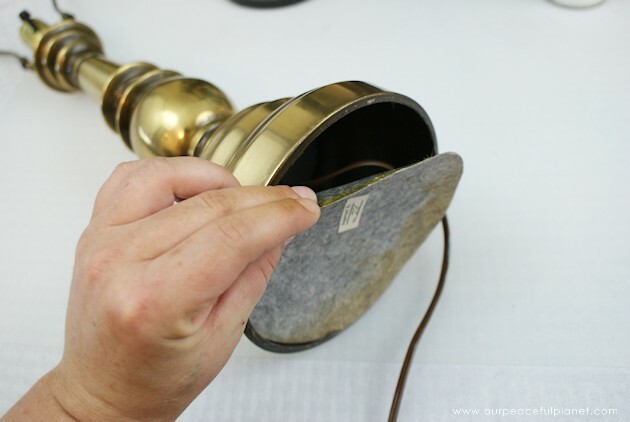 If the lamp has a harp to hold the shade, remove it. 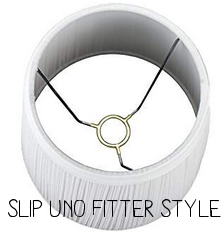 Place on the slip UNO fitter lamp shade. 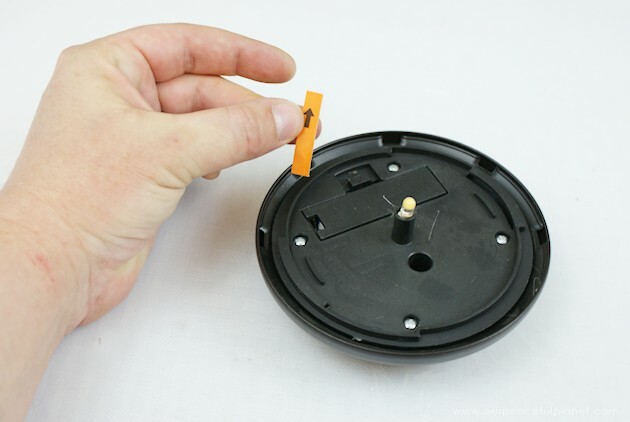 Fill the base of the socket with hot glue. 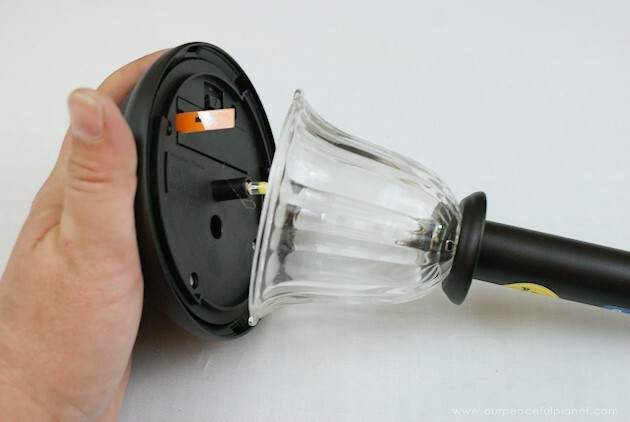 Insert the light portion of the solar light into the hot glue. 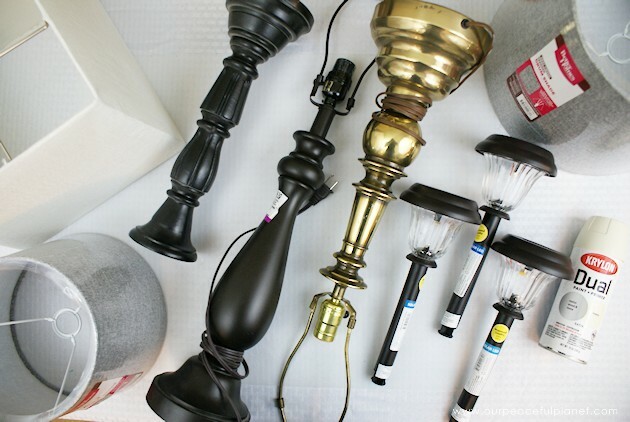 Once dry, place outside on your patio for beautiful decor and a cozy evening light! 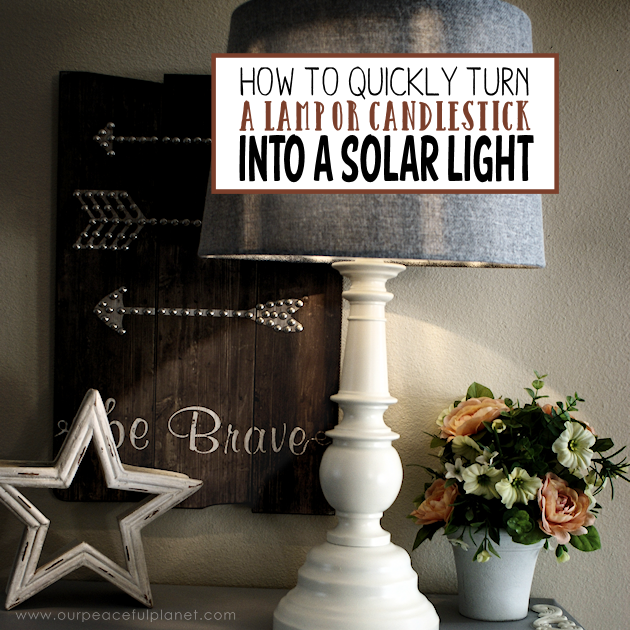 If needed, use a hand saw to remove the plug at the base of the solar light. 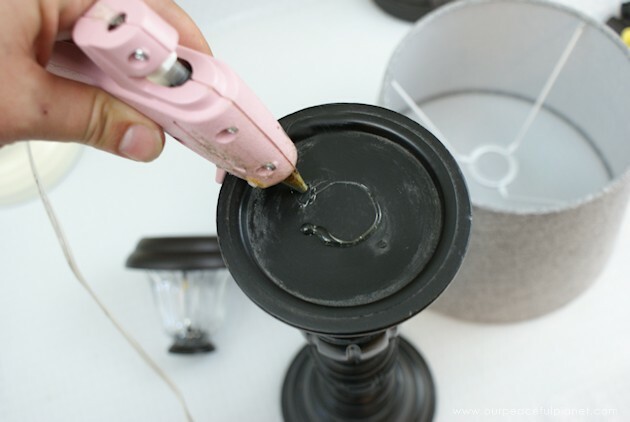 Place a ring of hot glue around the center of the candle stick. 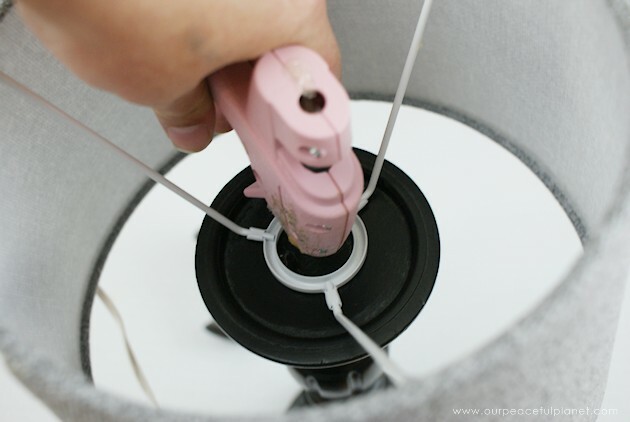 Rest the slip UNO fitter lampshade onto the ring of hot glue and let dry. 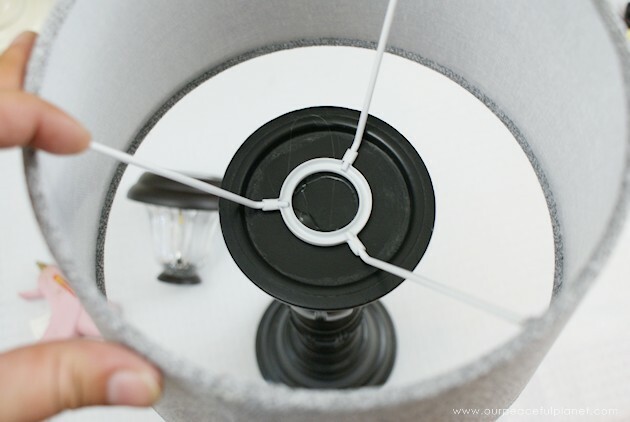 Apply additional hot glue to the top of the slip UNO fitter lampshade ring in order to secure the solar light. 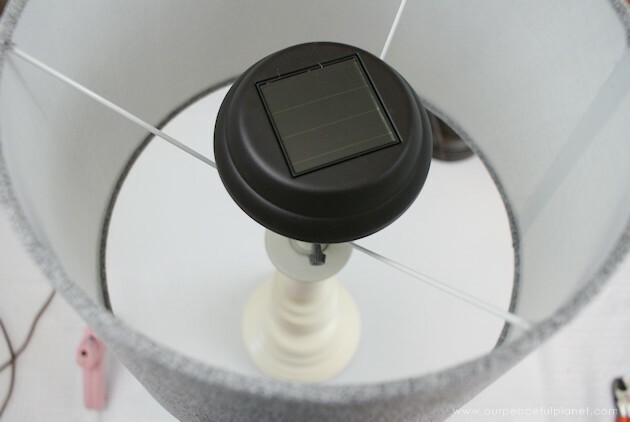 Place the solar light onto the ring. Let dry. I just discarded several of these lights from my garden because they stopped working. 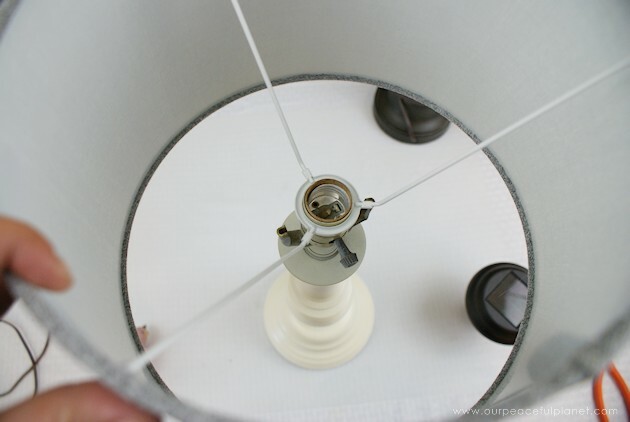 Do you change the light part out once it quits working? 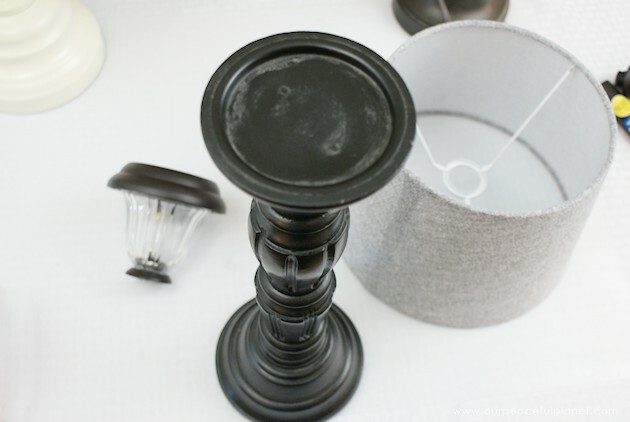 Next: Easy Room Divider for a Gorgeous Global Library Laundry Room Combo!